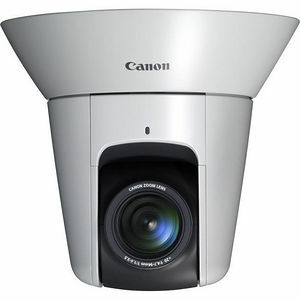 Canon's VB-M44 PTZ (Pan/Tilt/Zoom) Network Camera brings a high standard of image quality and capability to meet the demanding needs of the security marketplace. With a 1.3 Megapixel native resolution (1280x960) and a 20x optical zoom lens, the VB-M44 can capture detailed images even at a distance. This camera also features exceptional low light capability, boasting an impressive minimum subject illumination level of 0.05 lux in color at 1/30 shutter speed. Enhanced presets allow the user to save up to 64 presets that include pan, tilt and zoom positions as well as image exposure settings to ensure that the cleanest image can be attained even in the most challenging lighting situations. The VB-M44 comes equipped with a wide variety of features to adapt to almost any need. The Mobile Viewer allows the user to control the positioning of the camera on their phone or tablet device with the tap of a finger. On-board Analytics, such as motion detection and line-crossing detection, are available for intelligent monitoring - even in the absence of security personnel. To top it all off, ONVIF Profile S compatibility ensures that this camera will be compatible with many different video management solutions and cross-browser support allows the user to continue working with their favorite browser of choice. The VB-M44 PTZ Network Camera is designed with the user in mind and built to exceed the many demands for image quality, network security, performance, usability and economy in use.